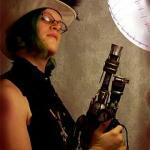 [Editors Note: I'm very happy to have the opportunity to introduce you to Meredith Scheff who will be doing a series of articles for The Steampunk Workshop where she will "go exploring in the jungles of maker workshops; and share the images with you, the hopefully regular reader." 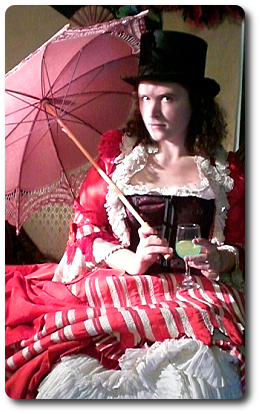 Meredith describes herself as "a cartoonist, maker, geek, and general silly person. She avoids everyone's advice and continues to live happily in San Francisco, no matter how tired of Top Ramen she may get. She is in her thesis semester for illustration/sculpture at California College of the Arts. Her website, until she builds a better one, is satiredun.deviantart.com." This weekend was Wonder-con, a fair-sized comic book convention held in downtown San Francisco. I go every year, mostly because it's convenient and to see my cartoonist brethren. However, this year, I went also to interview a man I've known through the comic book scene for awhile, and also who I thought all of you fine people would like to hear more about. 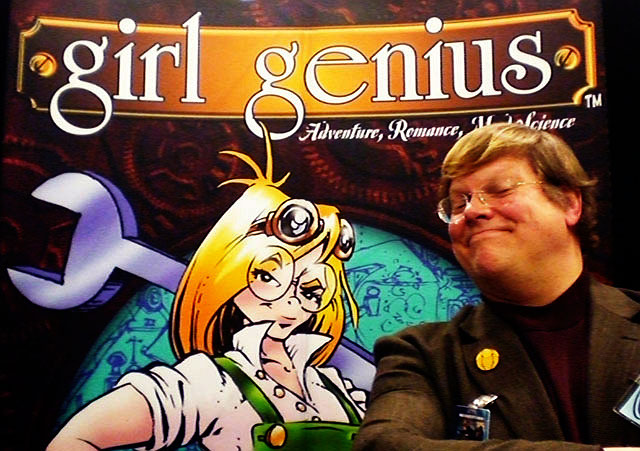 His name is Phil Foglio, and he is the long time artist/co-writer (with his wife, Kaja Foglio) of the acclaimed comic book series Girl Genius. I was pleased to find out that, in conversation, he gesticulates wildly. Steampunk Workshop: How long have you been working on Girl Genius? Phil Foglio: My wife and I started around 1993, just writing back then. There are an awful lot of comics that are really exciting, that just burst out on the scene, but don't come through because of not having planned. We were determined to at least have a beginning, middle, and end. SPWS: So when were the first issues out? PF: We published in 2000, episodes came out as a periodical- quarterly- and we collected them. In 2005 we stopped printing the individual issues and moved it online. Now we only print the collections. SPWS: What made you decide to move online? PF: For a couple of years, I knew that the Internet was a viable business model. I had been telling new comic artists "What are you, crazy? just put it on the Internet! ", and, I don't know, i was just too stuck in the old ways. We got to a point where it was time to print the new comic, and we just couldn't afford it, so we put it online. We now think of the printed comics as advertising- when new issues come out, sales of everything else exploded, like "hey, those guys are still alive!". 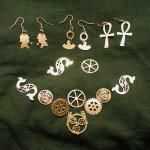 SPWS: What do you think of the recent Steampunk phenomena? PF: Steampunk.. we think it's hysterical. It's not new, It's been around for 100 years. It started with Jules Verne, Tom Swift. It's just that the term 'Steampunk' was invented in the 80's to typify the literature. We don't think of Girl Genius as Steampunk, we coined the term 'Gas lamp Fantasy'. People say we helped jump-start the genre, I don't think that. I think we were just a gateway. SPWS: What do you think of all the other Steampunk projects that have been created recently? PF: I love the projects! See, the Steampunk aesthetic harps back to a time where technology was much more understandable. You could look at- old steam engines and such- and know how it worked. Americans like to know how things work. Industrial Design now is about making a 'magic box'.. you look at your iPod, your computer, you can't just see how it works. These days, with all this magic technology, the conceit where you can look at something and understand it is very comforting to people. 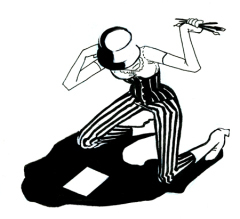 SPWS: Have all the new projects influenced you or girl genius, or pushed it in any new directions? PF: [laughs] It's a lot easier to find reference, for machines and clothing. People send us their projects and I think, 'sheesh, wow, that would work well', and then it feeds back into the subculture. SPWS: How do you think about Girl Genius's place is all this? PF: I think it's up to other people to place us in the Steampunk world. That objectivity takes time and space. 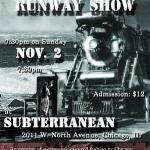 We're defiantly part of the Steampunk scene! I love this stuff! I want to see everything made from this stuff! The interview concluded, I told Phil how much I loved my pair of brass-colored Girl Genius goggles . . .
PF: Funny story . . . we had a guy come through Seattle (Phil and Kaja's hometown) from the distributor, trying to sell us more goggles. He showed us all the other models they carried. We said, 'no, all those other goggles are too modern and industrial looking'. "But" he said "you're the biggest retailer for goggles in Seattle! Surely, you do a lot of welding" "no" i told him, "We sell them to our fans – costumers and sci-fi fans" "Ooohh…" He said "So they do a lot of welding?". Phil, Kaja, and Girl Genius can be found at http://www.studiofoglio.com . More from WonderCon – La Legion Fantastique! 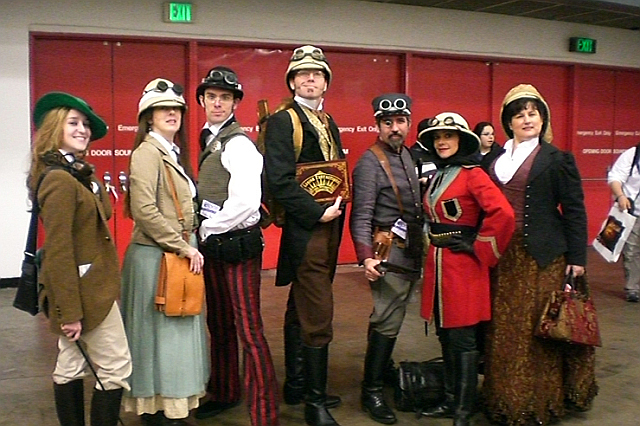 Quite the band of amazing misters and misses, out in their finest for Wondercon. I found them near the exits, so obviously they were on the run after a bit of rogue steamish-ness. " Lady Monroe, Amelia Peabody, agent Jhon Strock, Phileas Fogg, Captain Robur, Princess Aouda, Annie oakley.